A conversation with Hotel Director Steve Knott. Norwegian Gem is a popular cruise ship that attracts many repeat passengers. When a company has a winning formula, there is a temptation not to tamper with it. However, while there is a need to maintain what has been successful in the past, there is also the need to ensure that the experience remains vibrant so as to ensure that it does not become stale for past guests and so that it will continue to attract new guests. Therefore, Norwegian Cruise Lines continues to embellish the Gem experience with add new things. I spoke with Hotel Director Steve Knott about some of the more recent enhancements. Norwegian has long been known for offering guests numerous dining options. In February 2012, it added a new dining venue to the Gem, the Moderno Churrascaria, which is a Brazilian steakhouse. "Our shoreside people are always looking for ways to be a step ahead. To grow as a company, we are looking at the trends. The churrascaria is really popular in the US and in Europe at the moment. It has proven popular on here. We are doing 80 to 90 people on a quiet night." (See our review). The line is also constantly looking for new ways to use its existing dining venues. As a result, Gem now offers guests the opportunity to dine with the ship's officers. "We have the most high profile officers of any [cruise] company - - I challenge anyone on that. It is funny, we did the officers Q&A today and I knew all the guests. When I worked for another cruise company, you didn't know [the guests] at the end of the cruise. The company didn't encourage that sort of interaction." "If we can put the captain, the staff captain, the chief engineer and the two hotel directors anywhere on the ship, it creates a buzz around them. You can't believe the number of people that want to sit near us. People will come from other tables and say ‘Can I get a photo with you?" While informal get-togethers where officers dine with guests whom they know have been around for several years, Norwegian has now introduced an event where any guest can sign up to have dinner with one of Gem's senior officers. "We just haven't got enough officers. We have hundreds of people signing up So we [have] a lottery draw." The dinners are held one evening each cruise in the Grand Pacific Dining Room. Guests can enter by leaving their name at the Guest Services Desk. "We have also just introduced a chef's table. It is run in the dining area. It is a table of 10 to 20 people. It is several different courses with the wines. We are just introducing that now ". With the launch of the line's latest ship, Norwegian Epic, Norwegian has also established a reputation for offering numerous entertainment options. "We tried it on Epic and we are expanding it to the fleet. We are really expanding the entertainment." One new program that has recently come to the Gem is a version of the popular television game show "Deal or No Deal," in which guests can play along with the on-stage contestant through the use of digital handheld devices. "Our guests were saying we want more things to participate in. People love game shows. So we introduced the game and of course, the game comes with the chance to make money. People love it, they can't get enough of it." Another new program is cabaret shows in the Spinnaker Lounge performed by the ship's production cast. "We have a wide variety of guests. We have people who are 90 and people who are two years of age. [With regard to the more senior segment], our entertainment department from shoreside said "what was that age group into when they were younger?' They were into cabaret. Our cast loves it. They do the [large production] shows but that is not what they are necessarily trained for. They are trained to be entertainers and singers. They have embraced it and our guests have really embraced it. We also have our cast teaching ballroom dancing." Above: The ship's singers and dancers performing a cabaret number in the Spinnaker Lounge. 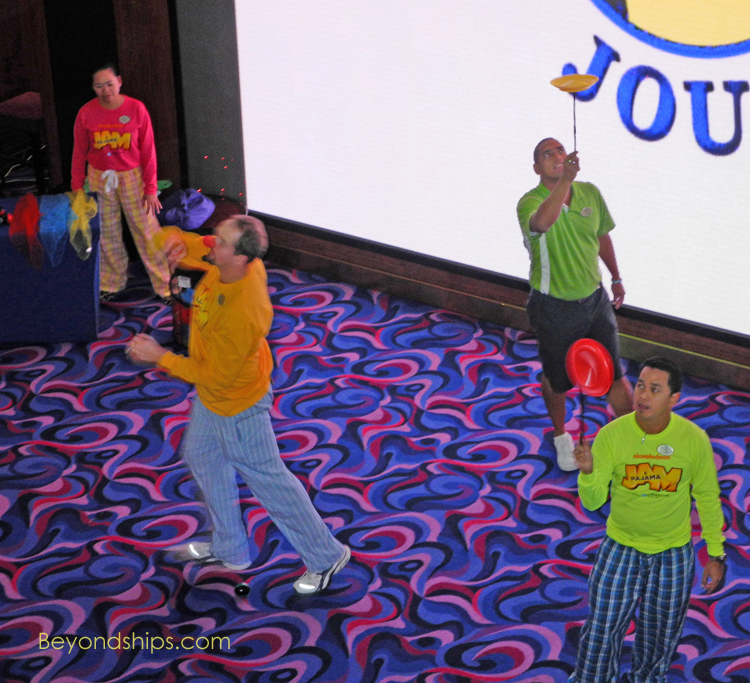 Along the same lines, the members of the cruise staff are being asked to utilize their talents in new ways. "When we are hiring now within the cruise department - - we don't call it a cruise department anymore, it is an entertainment department - - we are asking what skills does that person have? You come in and you may be great with guests but it is also what else do you have to offer? We have people who can juggle. [Our cruise director sings]. All these things are just enhancing the guest experience." Similarly, the ship's musicians have to be versatile. "Our show band, they now play in all the dining rooms. When we hire them we say they [also] can be a jazz quartet or they can be intermissionists." Gem now also features two pop groups, a Caribbean band called Caribbean Vibes and a British band called Ocean Vibes. The latter plays popular music including Beatles and Elvis tributes. "The steel drum is great, I love it, but it is not enough anymore. People go down to the Caribbean and they want the steel band but they also want all the other types of music as well. So our bands can play country and western, rock and roll, everything from Jethro Tull to Tina Turner to Lady Gaga." Above: Ocean Vibe playing in Magnums Champagne Bar. Above: Demonstrating how to spin dishes at a circus workshop. Gem has implemented a new children's program. The most visible aspect of this program is the participation of the popular Nickelodeon characters such as Sponge Bob and Dora the Explorer in certain kids' activities and events. However, that is not all there is to the new program. First, the new program is designed to be one in which everyone actively participates. "There are always kids who sit on the side. In years gone by, they would have been just left to sit there and they would have left [the ship] feeling 'I didn't have a really good time.' But now our instructors are going over and getting them to participate. So really there is a lot more participation." This participation includes not just the kids but adults as well. "Every cruise company says they are going after the family business but what do they do after they get it?" On Gem, Norwegian has implemented circus workshops, which were developed by Hilaro Productions Cirque Du Jour, in which kids and adults can learn skills such as juggling and dish spinning. "The whole idea is family fun. So you go to the circus workshop and you see mom and dad all doing it. We're saying if you come on as a family, we are going to teach you to be a circus act, you're going to be doing family Lego building competitions; we have the family Nickelodeon dance party, there is so much more happening." The workshops lead up to a circus that is held in the ship's theater on the last sea day. "The kids put on their own circus. They come out and do the parade and you've got the big top - - we set [the stage] up as a tent. They are going to go home, they have seen Nickelodeon, and been involved in the circus - - every kid goes in the circus." At the same time, Norwegian is mindful that not all of Gem's guests have children or are interested in a family vacation. "We don't pretend to be Disney and we don't want to be Disney. We don't have [the characters] running around the ship in every single part. We have a segmented market on here. The way we do our [character] pop-ups is based around the families. I was talking to some people today, and they said: "You have Nickelodeon onboard but you do a great job of hiding them. We are so happy about that because we didn't come to be a part of the Nickelodeon program". Then I have all these families coming up to me saying "Nickelodeon is fantastic." So the way we run our program is this huge exposure for the people who want to see it but other people do not have to worry that they are going to be overrun by characters because they are just not." The guests' cruise experience on Gem is also being impacted by the introduction of new technologies. An example is the introduction of an interactive television system which, amongst other things, allows guests to book shore excursions and check their onboard accounts from the comfort of their staterooms. "Interactive TV allows you to come on, go to your room, sit back and do what you need to do without the stress of lining up. The other day we had 1,200 people on tour in the Bahamas. That is either 1,200 people that go along to the shore excursions desk or 1,200 people who pre-buy or use interactive TV. So you have no lines. Our shore excursions desk is like a ghost town some of the times." Along the same lines, Norwegian has expanded the range of things that can be reserved prior to the cruise beyond just shore excursions. Guests or their travel agents are now "able to go on the internet and book all of their restaurant reservations, make all their show reservations, the whole lot. It is one stop shopping. You come on and you've got it all done." Not only are there fewer lines at the Shore Excursions Desk but the lines are also less at Gem's Guest Relations Desk. While part of this is due to the fact that guests can check their onboard accounts via the interactive television, Knott attributes most of the decline to a change in management approach. "We have really minimized the lines on the ship by empowering our people to take ownership of the issues. It is this great program that we have onboard: "Yes We Can' - - every one of the crew members on here is empowered to fix an issue. Before it was go to Guest Services. Now it is your issue. If it is shoelaces, a band-aid, headache tablets, whatever it might be, we will fix your issue."